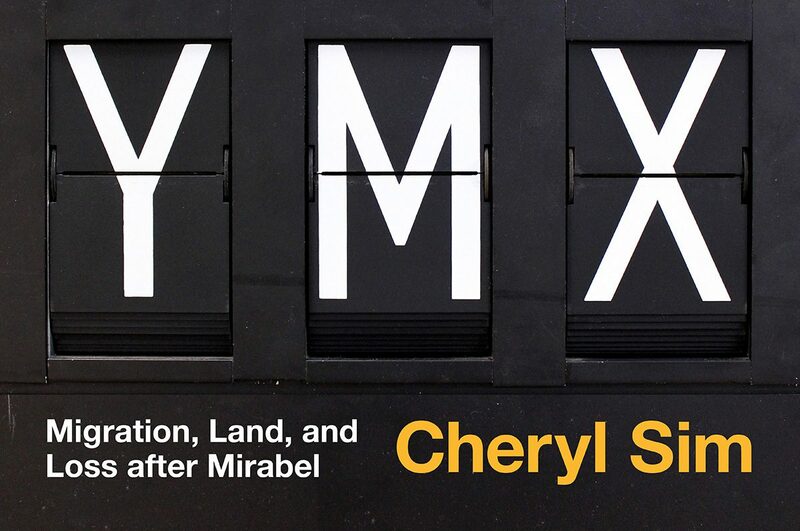 Our first soft-launch of Cheryl Sim’s exhibition at the CJ Media Gallery has been really amazing to troubleshoot some of the coding glitches and work out the machinery. We’re realizing that the timing needs to be quicker for an art exhibition than the machines are used to. Thankfully, Mark Demers (of Spikenzie Labs) has been on hand to help us iron out all of the wrinkles. The boards look amazing as an installation, and see how we’ve aligned the bench like it’s a small waiting room at the end of the space? In the meantime, for those who can’t make it to the exhibition, we’ve got Mark’s final Solari Schematics, a ‘readme’, and some of the Arduino files. If any of you are working on your own Solari board, use and build on our files for your own projects. Zipped file here: YMX_Solari_Concordia. After many months working on the Solaris, germinating ideas in the dark of winter, the project is almost ready to spring up into the light. 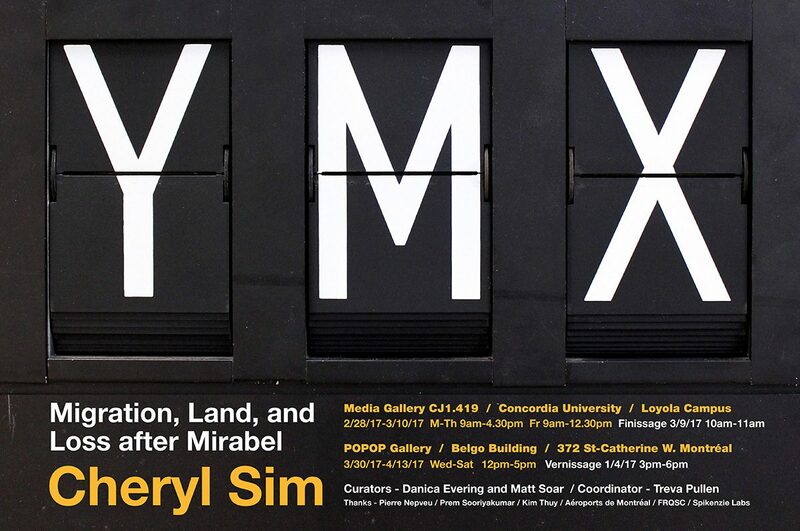 We’re excited to launch Cheryl Sim’s installation with the boards, YMX: Land, Migration, and Loss after Mirabel on April 1, 2017 from 3-5 PM at Galerie POPOP (Belgo Building – 372 rue Ste-Catherine O. Espace 442-444). The show will run until April 13. Sim has been working on an installation that uses our two Solari boards as a starting place to talk about the multiple levels of human and other-than-human movement through Mirabel: those displaced from the land to build the airport and the thousands who arrived at Mirabel escaping war, disaster, or economic adversity. Upon entering the darkened gallery space, visitors will follow a labyrinth of airport belt stanchions. 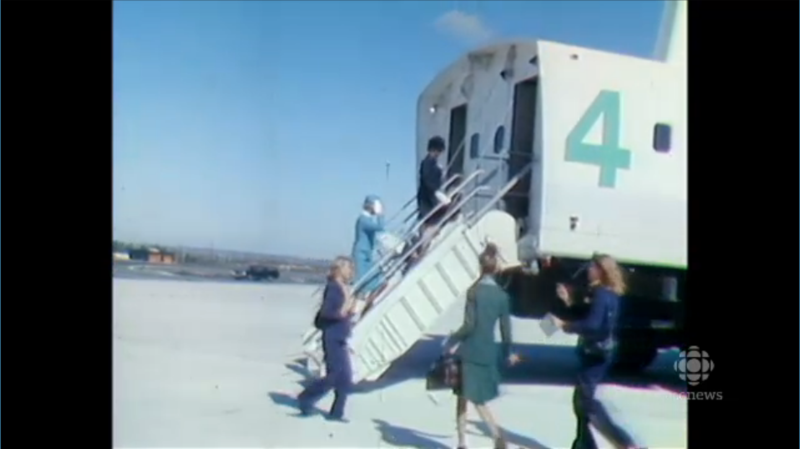 Along this winding path, the visitor will encounter a video montage of interviews and archival materials reflecting Mirabel’s many intertwining narratives. This lyric video work weaves together the voices of poet Pierre Nepveu, whose family were expropriés, the farmers displaced to build Mirabel, and producer Prem Sooriyakumar and novelist Kim Thuy, whose families both immigrated through the airport. At another stop on the path, visitors can stop and read from Lignes Aériennes, a collection of poems about the airport by Nepveu. At the end of the path, in the corner of the room, Sim has drafted an abstract script that our two Solari boards (Gate 46 and Gate 48) will read to one another. Although the boards have limited alphanumeric options (each can only display total of 6 letters or numbers), the script Sim has drafted has an iconographic quality. Mark Demers has been working to connect the two boards so that they can be programmed by one script. This is really exciting, as it means the boards will be able to “speak” to one another rhythmically—through call and response, or changing in unison. They’ll be programmed through a single SD card which will hold the program and the script in a TextEdit file. It’s amazing to have both of the boards functioning now. Stay tuned for more logistical details—we’ll share those soon. We’ve also been working with local metalworker Colin Burnett of ICON L to make our signs freestanding. Colin has welded each of the boards two steel legs to stand on. 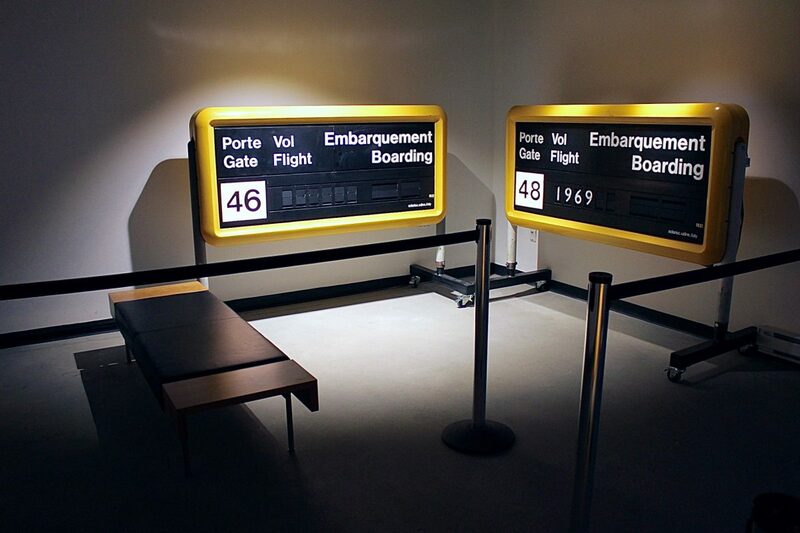 In Mirabel, the signs once hung from the ceiling of the airport on burly pipe-like arms. These arms weigh almost as much as the signs themselves—we’ve been working out our own burly arms moving them around the Solari Lab! 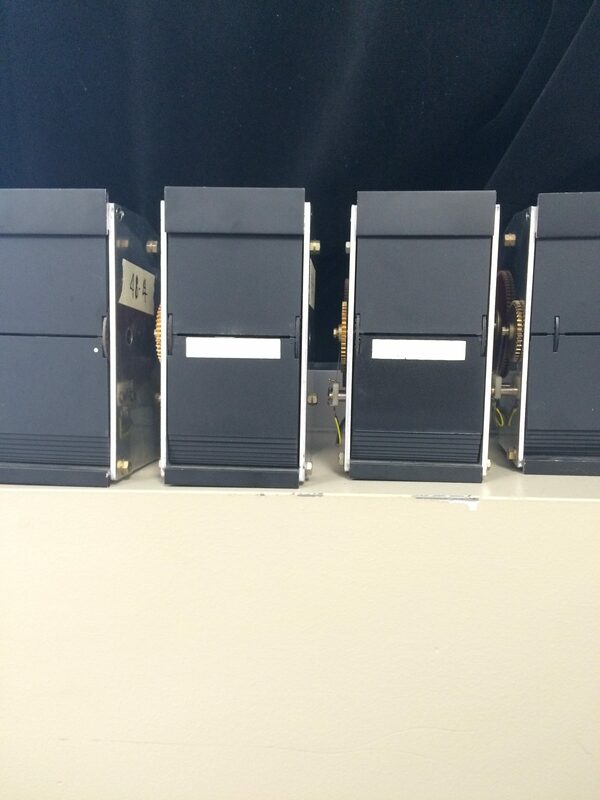 Each unit is very heavy, so we wanted a system that would allow them to be moved more easily from space to space. The new legs fit up inside the existing pipe, fitted with a bolt that acts like a pin to keep the legs from swivelling. The feet are 3 ft each, so they fit neatly through the door and so we can still squeeze them into the elevator. Each foot is equipped with two swivelling caster wheels, so they can roll easily and then be locked into place when they’ve been appropriately positioned. 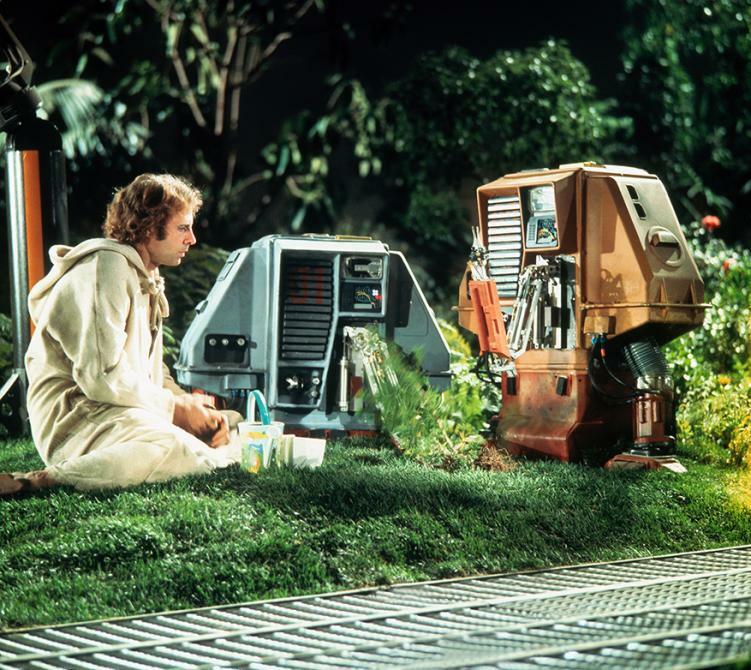 Matt mentioned in the summer that when the units got legs, they were going to remind him of Huey, Dewey, and Louie—the three service robots from the 1972 post-environmental-apocalypse sci-fi film Silent Running. And they do, don’t they? They’re almost-identical twins—similar, but each with their own personalities and quirks. These particularities will no doubt play into their performances in the installation in April. We had a lovely back-and-forth with another Solari owner and operator, Lynn Shade, a US designer currently living in Japan who found us through the Atlas Obscura article. She’s got a handsome cherry-red three-line 81-cartridge Italian departures board, which she’s rigged up with a couple of technically-minded pals to display people’s messages that they send via Twitter and that are fed back online via webcam. You can check out these messages on the board’s twitter feed, @hellosolari. We know a few of you following along at home are keen to hear more about the tech information of these boards, and so we thought we could share a bit of our email exchange, which also includes some details on the artistic development of the project. “[F]rom our side we can tell you how we hooked it up to Twitter plus webcam so anyone in the world could write to the board. Unfortunately as I write the board’s Twitter connection is temporarily down. Originally it was connected to a Raspberry Pi & Pi camera and now an Intel Compute Stick + webcam. The Intel is super buggy and keeps flaking out…thinking about going back to Raspberry Pi but a more powerful one. I’m interested in figuring out how to change my board from line-by-line flipping in sequential order, to randomized full board simultaneous flipping. 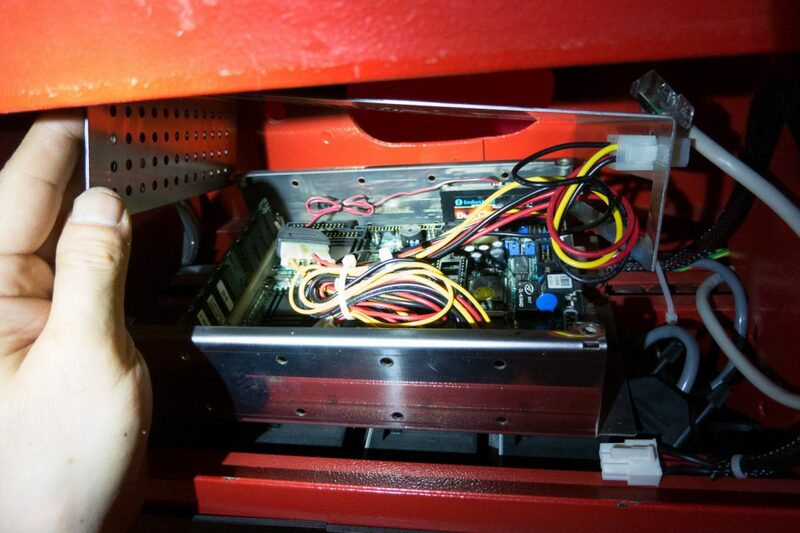 “We’re working on two stages: currently our friend Mark from Spikenzie Labs is doing the heavy lifting (in the complete absence of schematics) of building the Arduino boards we need to get them working again. As you might have seen from our website solaris.concordia.ca each of the two signs has an array of eight units; the first six are all the same (alphanumeric); the last two are to display the 24-hr clock in 15-minute increments. Right now we can control all the units in one of the signs by sending commands from a laptop running the Arduino software. I believe ours are ‘simultaneous’ but strictly speaking sequential – just very fast, one after the other. Mark might be able to explain that better. “Everyone I’ve worked with found the specs useless. The “Ethernet Kit” they refer to is 20-year old CPU with a Disk on Module (photo enclosed) which Solari connected before I bought it. That ethernet cable is simply plugged it into a wireless router. There was some confusion before figuring out my modem subnet range needed to be reconfigured since Solari had hardwired the web address 192.168.1.200 to the board…but you won’t have that problem as you’re building your own. Write to Lynn’s board on Twitter by sending a tweet to @hellosolari! Within 5 minutes, you’ll get a tweet back with video and audio of your message. The 3-line board’s capacity is 27 characters per line. For line breaks, type “space / space”—for example: “first line / second line / third line”—if the message doesn’t indicate line breaks, the board won’t flip. Like our board, in addition to the alphabet from A-Z and numbers from 0-9, @hellosolari can also display a period, a hyphen, a space, and a slash. Solari – virtuoso demo from Matt Soar on Vimeo. It’s been an exhilarating week: Mark Demers from SpikenzieLabs was in on Wednesday to finalize some work on our #48 board, and had a wonderful surprise for us – a program made in the difficult-to-search-for-but-easy-to-use automation software Processing. Drawing from a TextEdit file, Processing allows us to create sequences of commands to send to the panel in our Solari board. 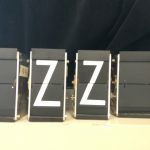 Mark wrote a sequence that allows us to demonstrate the capacity of the program to change speeds, to turn the light on and off, to set the display and clock at the same time and independently, and to activate individual units one by one. This ability to program in advance will be instrumental in thinking about the possibilities for the signs’ use in a public art installation. The software allows us not only to set the speed of the flapping, but also how long the program waits before sending the next command. Thinking about programming in this way feels a bit more like a composition or a choreography of sound and movement and symbols. Given these commands to run through instead of entering them manually changes the call-and-response dialogue of entering data and listening and looking for a result. Instead, the program allows the sign to perform. Listening to the Solari run the course of its automation, you begin to notice the nuance of the sounds of each unit. Its second display unit rumbles, lower-pitched, while its first has a higher voice. 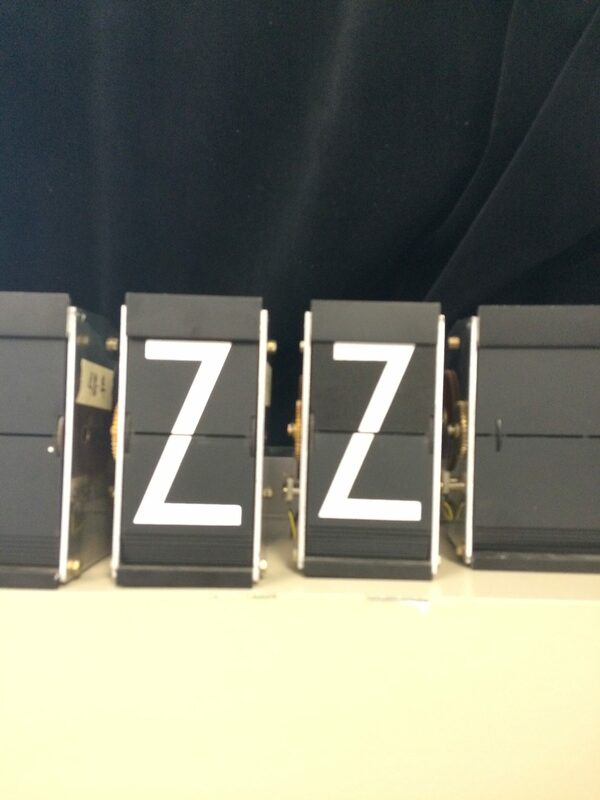 The clock units have a more lispy whisper on account of their large, thin size. And the light turns on with a slight upper ping, as its taught spring switches and the filament flushes red at the sudden rush of electricity. An index points. We might think of the index as an outstretched finger directing the way. (This is how the first finger on each hand got its name, the index finger—the one that points, that indicates, makes known). Or, it is a list in the back of a book that directs you to the correct page number to find the information you require. In 19th-century semiotics, philosopher Charles Sanders Peirce sought to formalize a way of thinking about signs as a continuation of his studies in logic. He wrote about the icon, the index, and the symbol. The icon physically resembles the thing it stands for (a small picture of a plane stands in for the plane itself) and the symbol points to connotations (usually word-based, but also in the sense that the bald eagle is also a symbol for the USA). However, the index is a sensory feature that correlates and implies something else. The classic example of an index is the presence of smoke, an index of a nearby fire. Though it may have been unintended in its original design, the rhythmic clacking of the Solari display also has this signifying effect. Its cascade of clicking turns faces upward. The noise of the circulating flaps acts as an index—it points to new departure and arrival information. And maybe this indexical noise can’t be underestimated—when Boston’s Massachusetts Bay Transportation Authority replaced their split-flap displays in 2006 with digital LED displays, they retained the noise of the analog departure board: a tick-tick-tick emitted by a speaker system inside of the board when the schedule changed over. In addition to the rustle of letters, there are a few other factors that make the analog split-flaps appealing (aside from retro-nostalgic longing, which is patently undeniable and yet perhaps a whole other story). 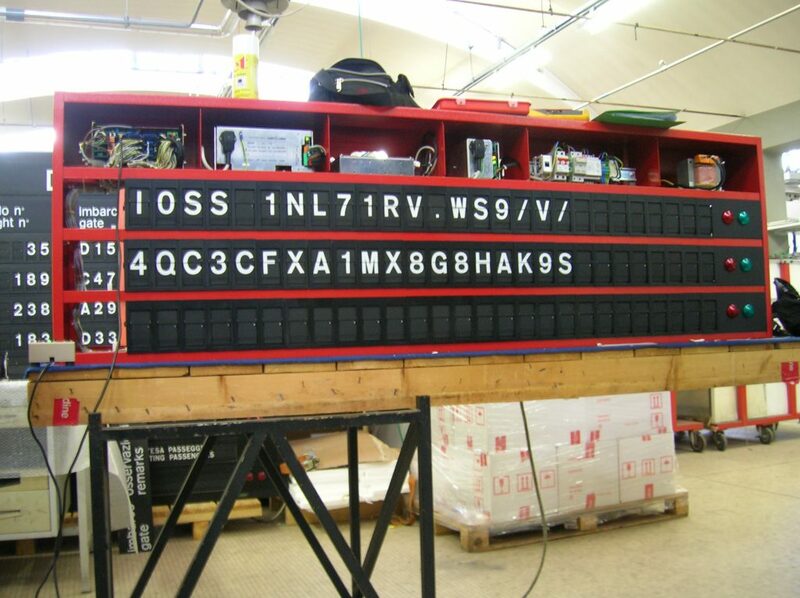 Unlike digital displays, which become washed out and hard to see in bright light, and can only be read when regarded straight-on, the high contrast white-on-black letters of the Solari display allows for higher visibility in most light conditions. 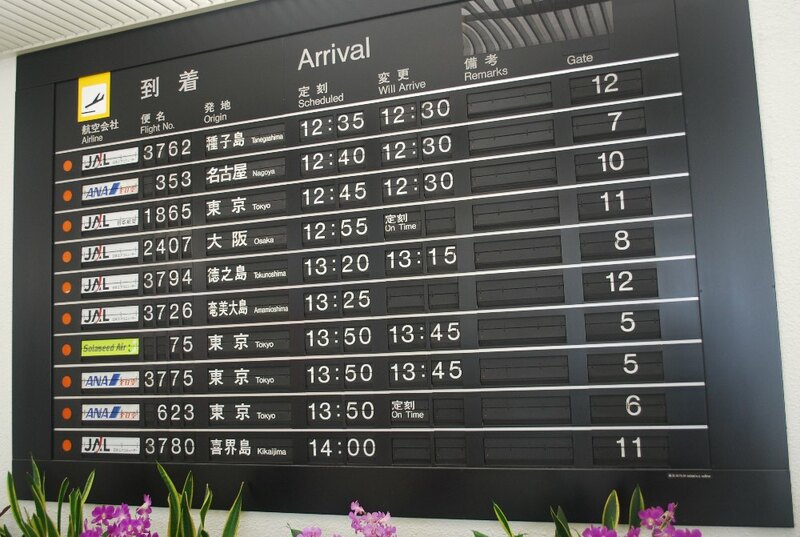 It is also able to be read from many different angles—which is useful in airports and train stations, where people are dispersed across the arrivals and departures area. 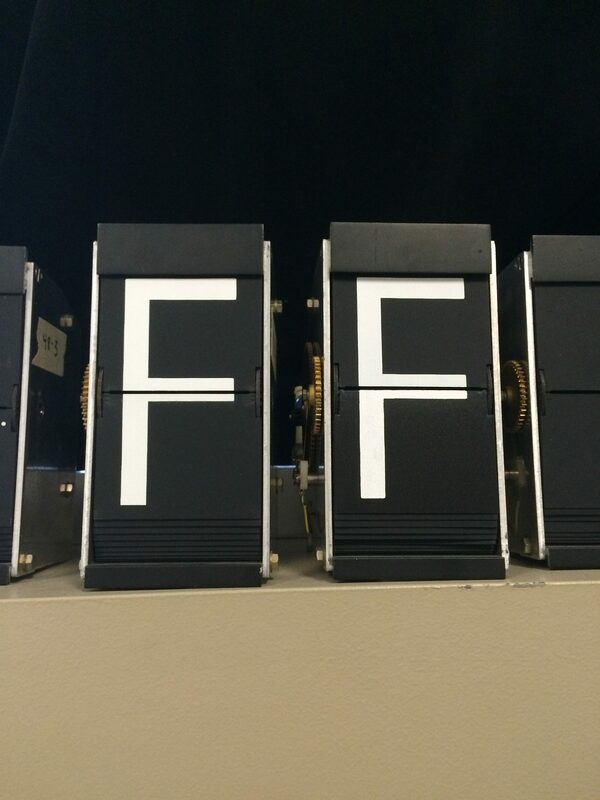 Additionally, unlike a LED display that must remain lit when it is static, a split-flap display uses very little power until it is instructed to flip. And if power is cut temporarily to the system, the information remains visible instead of falling dark and then resetting in a jumble when the power returns. 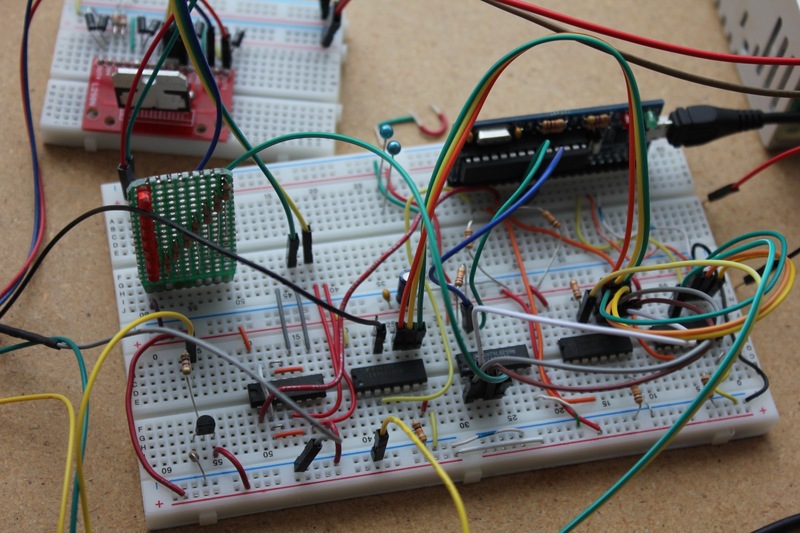 Although we’ve delved mostly into the visceral mechanics of wiring and breadboards so far, the flaps themselves are the capricious face of each display. Originally metal and later plastic, they came in the form of a fixed text (the whole name of a station or an airline) or an alphanumeric display that could be programmed individually. 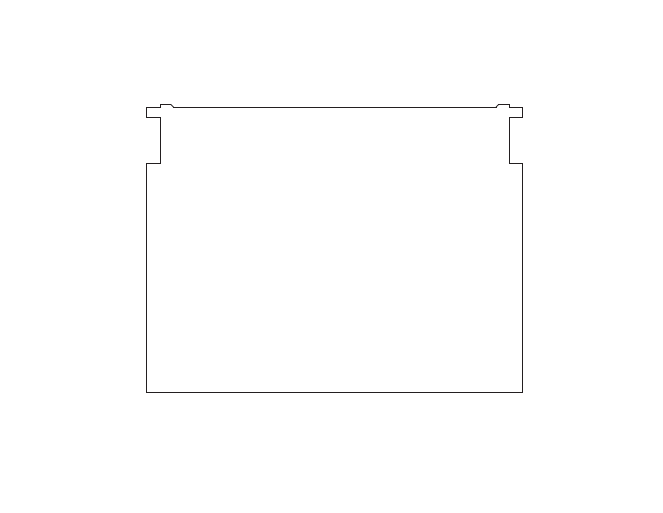 They would have been industrially cut and silk-screened in sheets. This was complicated in terms of individual replacements. As Tom Chaffin, the acting Principal Engineer for Telecoms at Thameslink writes of the fixed text displays, “every time the timetable changed altering train service calling points or final destinations changed or even for a train company name/branding change, new flaps had to be silk-screen printed and then inserted into the indicators ideally the night of the timetable change.” With an entire rail or airport system, this process was costly and time-consuming. As a person responsible for the twice-yearly updates for the Southern Regions rail system reminisces, delivery took about 9 months, so you would have to predict requirements a year in advance. However, he notes, they could also order the flaps in multiple colours, and even could use the “rest position” as an advertising display for newspapers and whiskey. 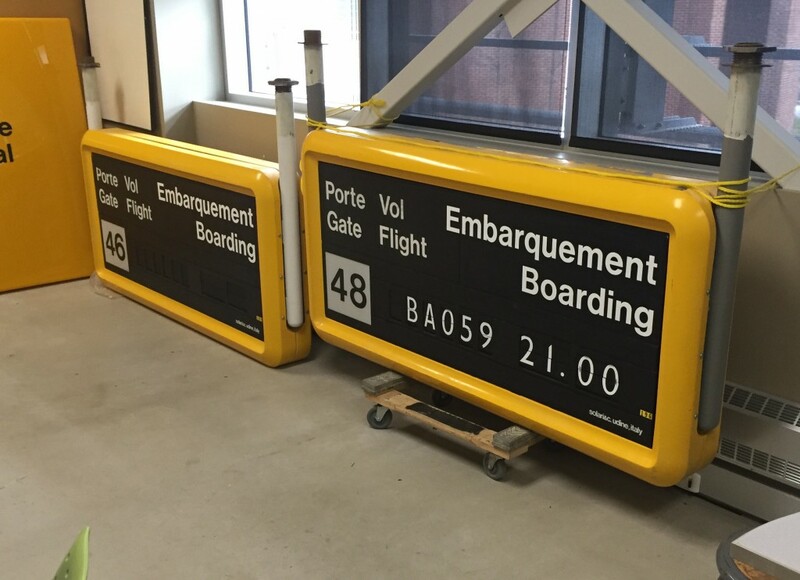 We’re working with two arrivals/departures displays—relatively small ones in the grand scheme of the giant multi-city boards Solari has manufactured—each display has eight cartridges, each cartridge has 40 cards (and how many were there going to St. Ives, I wonder?). 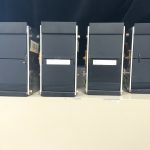 The first six cartridges in each board are 2-inch alphanumeric displays, followed by two larger cartridges to display a 24-hour clock. Inevitably, just in the ordinary course of their use—to say nothing of the subsequent closure, abandonment, and decay of Mirabel—at least a few flaps would have gone missing. We had to get an overview to make sure we had a full set. Earlier this summer, I flipped through what should have been a total of six hundred and forty flaps, so we could make sure that we had a complete set. Incredibly, we’re only missing two. 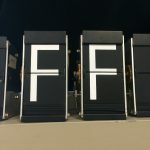 I wrote earlier about our makeshift replacement flaps in this post, laid out in Adobe Illustrator and sliced from the matte black plastic file folders Matt had found in the Loyola Campus bookstore by Mark’s laser cutter. Next, we needed to get the letters printed onto the black plastic. In an early experiment, I wondered if we might be able to paint the letters on with a brush. It seemed like the best choice to start, given that we only needed two flaps. I marked off the bottom half of the test B with painter’s tape and gave it a go. However, when I carefully tweezed off the tape after the paint was dry, the results were less than inspiring. The edge was a bit ragged from paint seeping under the tape or being pulled off in the removal process, and the brush marks bunched and stripped the paint in varying ways across the surface. So, we needed a different option. 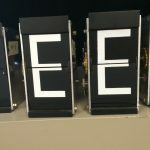 MIT’s The Beach Lab, in an effort to make their split-flap display relatively inexpensive, opted for cut vinyl letters. You can learn more about that project here. But I was so taken by the crisp edge of the screen-printed letters of the originals, and wondered if the vinyl letters might stick out sorely in a cascade of printed ones. It looks like others have done this method also—of cutting the flaps first and then individually screen-printing—like this dance company in preparing a board for a performance about travel. My pal Justin Gordon is one of the three founding members of the excellent Montreal-based printmaking collective and studio Atelier Lost Cause, along with Concordia fine arts students Gabrielle Mulholland and Hillary Barnes. I asked him if he could help us out with printing, and he said he could try. 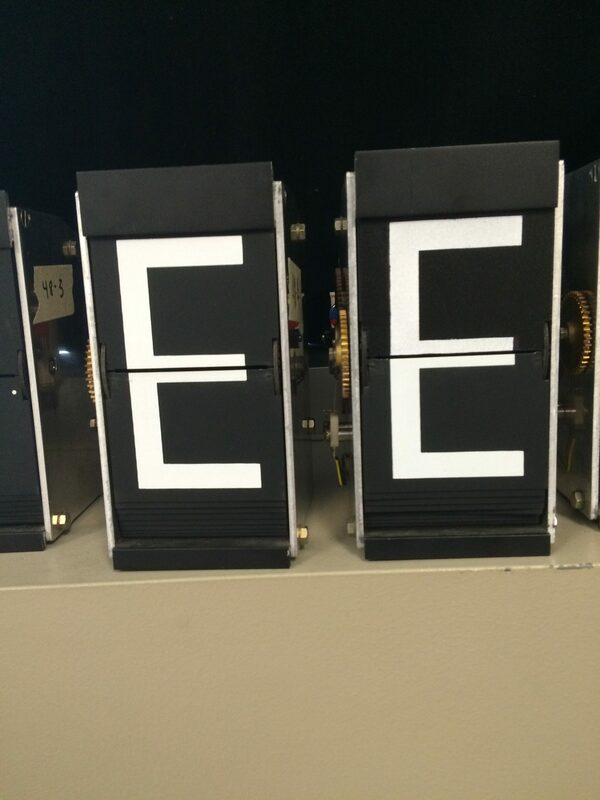 I’d traced both sides of our missing letters (top of an E/bottom of an F and top of a Z/dash) at the lab and taken them home with me. 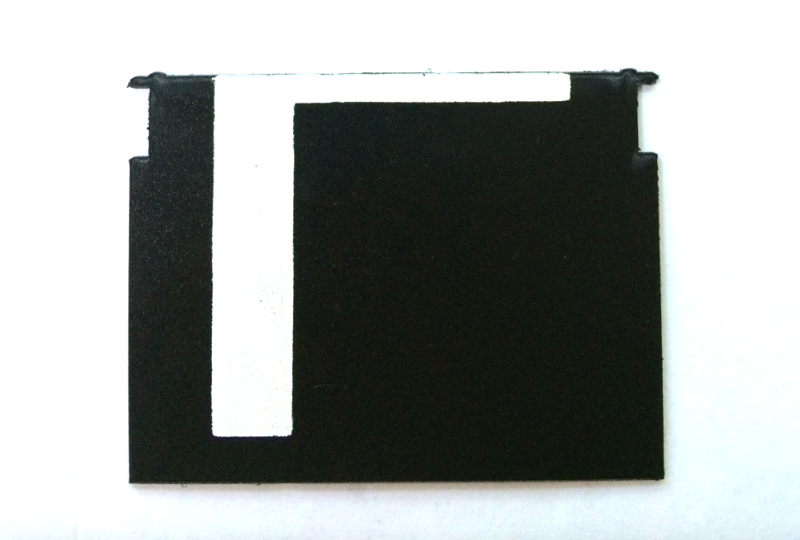 In order to screen print, you need the parts you want the colour to go in jet black, and the other parts white. 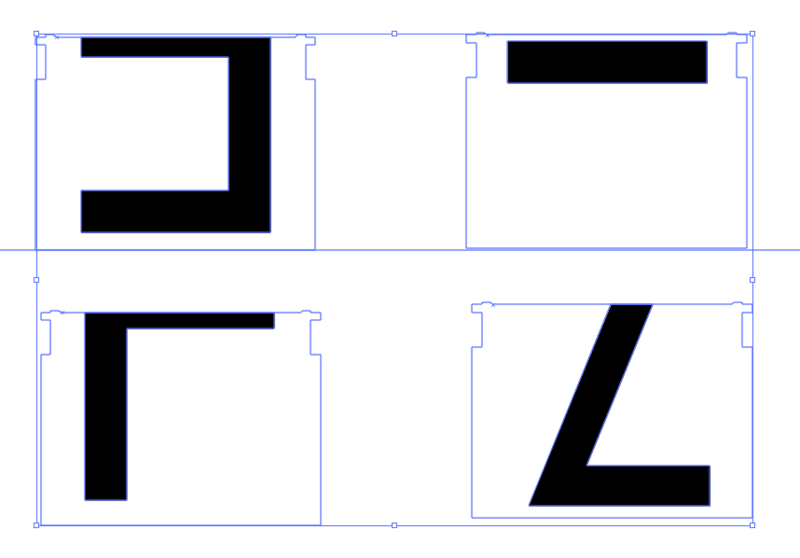 I took the original layout of the split-flap I’d made in Adobe Illustrator to use for the laser cutting: …and repurposed it for our four half-letters. I carefully measured the tracings and laid out the letters in Illustrator, filled them with black, and printed them out on ordinary paper (with back-ups—in case one of them didn’t work out). Justin laid all four letters out with oil on one screen, exposed it, and then we were ready to go. We laid down a test onto acetate so we could see where the print would land, lined up each black flap behind the acetate, and printed the letters. They were a bit sticky when they came out, and so we tried to dry them under a heat dryer, which resulted in melted plastic. A brief stint under the dryer, and then some time by an open window, and they were ready to print the other side. Here they are—crisp, clean, and smooth, and although the gloss of the letters isn’t exact, it’s a pretty good match. R. Port, “ICON, INDEX and SYMBOL (Short Version),” http://www.cs.indiana.edu/~port/teach/103/sign.symbol.short.html. Mac Daniel, “Nostalgia for noise at South Station,” Boston Globe, 6 April 2006, https://www.ble-t.org/pr/news/pf_headline.asp?id=15901. I should have had both a copy with the outline of the flap for a guideline and one without for the printing, but I didn’t print the latter! This meant that Justin and I had to cut carefully around each letter, lest the outline of the flap be printed in white onto the edge itself.